Gaston grew up in Central Vermont. After graduating high school, he started training as an electrician. In his off time, Gaston enjoys hiking and experiencing the outdoors. 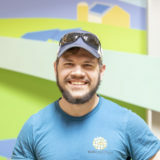 Using his electrical background, Gaston wants to help do his part to better our environment, and joining the SunCommon team was a great way to do that.